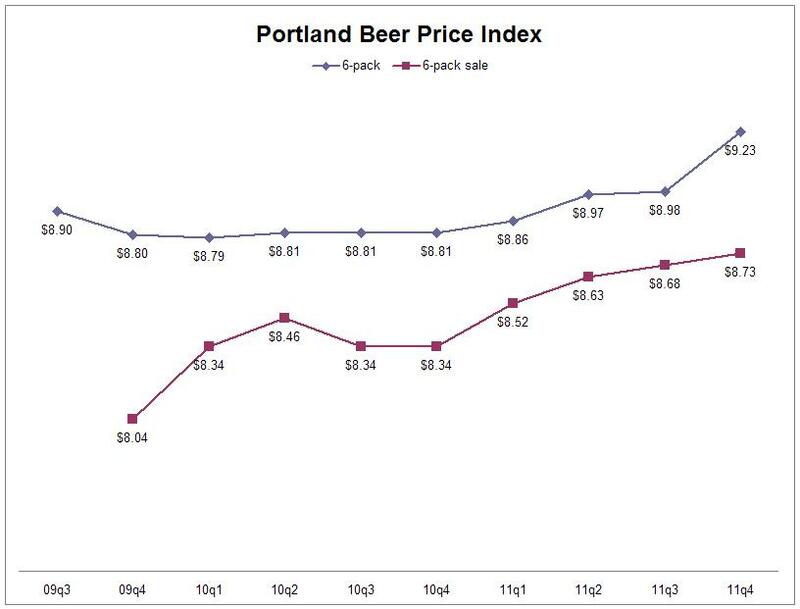 An anonymous commenter last quarter said that wholesale six-pack prices were heading up, and that certainly showed up in the six-pack retail prices: this was the biggest jump the PBPI has ever seen. In fact, everything went up this quarter except happy hour pints. One pub raised their regular pint price, but kept the happy hour price the same. I'm sad to see bomber prices bounce up from their record low last time. They are still overpriced, with basically the same SPE price as happy hour pints. As far as logistics go, I had to adjust the prices I have been recording at the Pearl Specialty Market, because I didn't notice until this time that their shelf price includes the bottle deposit, even on six-packs. Not that most of us cash those deposits back in, but all the other prices I've been recording leave off the deposit, so this time I brought Pearl's prices down accordingly. As a result, the previously reported Q3 numbers are slightly higher than the base price used for the price differences above. Has the beer selection been shrinking at the Seven Corners New Seasons? Unlike QFC and Fred Meyers, they continue to carry Pelican IPA, but they did not have sixers of high-volume standbys Widmer Hef or Deschutes Black Butte Porter on the shelf, nor did they have Rogue Shakespeare Stout. I was able to record reasonable prices since they had other bottles from those breweries that are always priced the same as the missing ones, but it makes me wonder what they're up to. Finally, I want to remind everyone that this is not a complaint about beer prices, not that I'm above that, especially with numbers like these. But the main purpose of the PBPI is to track price trends over time. Click here for an explanation of how the numbers are gathered, and check back three months from now for the Q1 2012 PBPI. If I had to venture a guess, I'd say to get ready to see even higher prices next time. As flat as prices have been the last couple years, we were bound to see them spike. Ah well, it goes to a good cause! I have certainly noticed many beer bars raising pint prices. That's been the most noticeable in the past year IMO. I am buying less standby favorites on draft in favor of bottles. Usually only buying a draft beer now when trying something new. 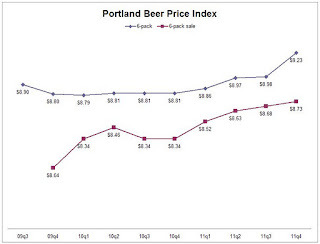 I've been thinking of starting a Vancouver Beer Price Index, based on the model you've put forward here. I just need to find the time (read: motivation) to do it. Regardless, I'll be sure to send you a link to it if and when it happens as the, supposedly high, prices here are close to half what we pay just north of the border! @Matty: Please do! When I was first starting, a commenter said he might do one for Washington DC, but I don't think it ever happened. A beer index in Vancouver (BC I assume) would be interesting to watch. From what I have see so far cost to retail price on packaged beer looks pretty flat Q1 2012 versus Q4 2011 with the possible exception of a few higher end bombers. That said, retail pricing on six and twelve packs were pretty aggressive in Q4, so I expect the next survey to show a very small increase on six packs and maybe, just maybe a 5 or 10 cent bump on bombers. I don't work with draft beer at all, so I really can't make a meaningful comment about those prices other than to note with the minimum wage bump effective 1/1 of 30 cents per hour, some of these sellers may feel some pressure to raise margins. @priceit: Hey, glad you're back. I was impressed by your inside scoop last time. Would you like a bigger role in the price index, at least as an advisor? If so, shoot me an email. There's a link to my address on the front of the blog.